Why Make an Art Journal? Writing in journal can be therapeutic. 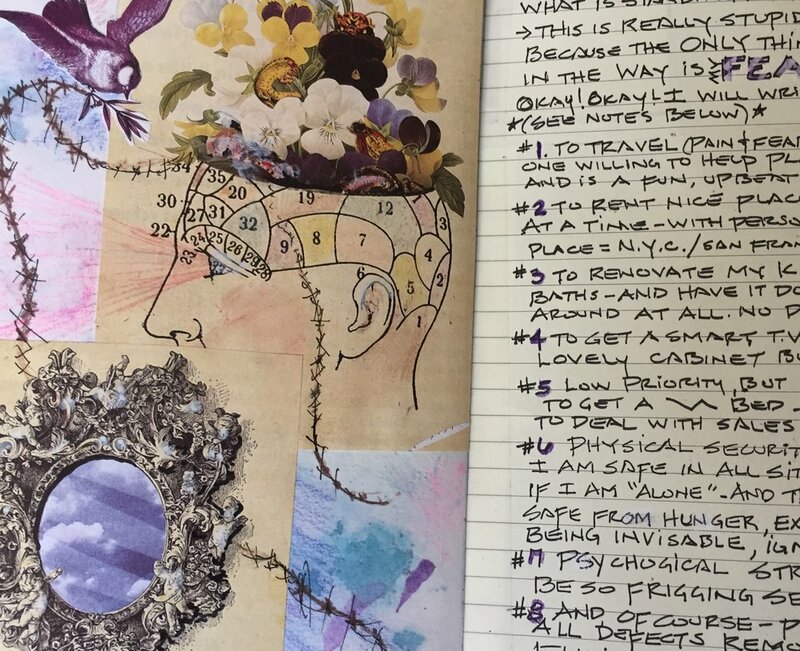 Adding art to a journal builds on your creativity. When you express your thoughts, memories, feelings and emotions in a journal, you touch a deeper part of yourself. By adding art (shapes, lines, doodles, colors, photos, collage, sketches or full out paintings) you discover new insights about yourself that may otherwise stayed hidden and you discover how to tap into your creativity. When you understand the language of art, how lines and shapes speak, you communicate with a more conscious part of yourself to gain wisdom. You already speak with the language of art each time you doodle. When was the last time you were on the phone and picked up a pen and without thinking, you start scribbling on a piece of scrap paper (or something you later regretted doodling on, like I have a hundred times.) Your creative side is expressing something to you in that moment while you are not thinking. Yes, not thinking. While the logical side of the brain is engaged in conversation, the right, creative, feminine side of the brain is busy talking to you in doodles. They may appear as boxes, circles, arrows, faces, and tons of other shapes. What do you doodle over and over? Why do you do that, any idea? What I discovered after a decade of researching and working with thousands of students is that the boxes you draw have structure. They show a desire for organization or even safety. If you prefer more circular shapes, say a flower, this represents most likely love toward family, a group or community. It makes sense, a circle is more loving, no hard edges, soft lines and when surrounded by other circles it is most likely a loving group of people all united in some way. You can use collage (cutting and pasting images from magazines) to express your thoughts as seen in this journal by C.M.. Collage is perfect for beginners. There is so much information in those lines. When you take a class with me on journaling, I help you to discover what the subconscious is attempting to teach you. One tip right now you can use is to see what kind of lines come forth when you are angry. Real easy to do... grab a pencil, paper and think of something that makes you angry. Let the pen or pencil draw. See the lines? Feel how good it feels to let this anger go? Now, shift to a happier thought about some good news you would like to receive. Draw this desire. Get the picture? You can grow into a new person who is less fearful by playing with your doodles. If you are already an artist, imagine where you can go when you learn what your paintings are trying to tell you. What are you communicating to others by the choices of colors? What galleries would you be in if you weren’t afraid to approach them or get rejection? When you decide to start adding art to your journaling experience, you allow your inner child to come out to play. When you were young you picked up a crayon and you did art without thinking. Thinking, that is the culprit that gets all of us in trouble. Just play more, start small to grow big which is why I like the journal. There is always time to do a few sketches anywhere. We waste time sitting in traffic, waiting on line, waiting to meet a friend. Use this time to journal. Journaling helps both your personal life and if an artist, that too. Before I start my paintings, I work out all the issues small. Then once happy, I can take the piece as large as I want to. The sky is the limit. Fear can hold you back in life. Fear can keep you from living your dreams. Fear keeps you from knowing yourself, your true self. Fear is false evidence appearing real. Art is a tool to overcome fear. In my workshops through a series of exercises, we give fear a face and reveal the false friend it is. Record happiness, let go of anger, figure out options, record memories when traveling, you name it, journal it. In my Color & Energy workshops you learn to doodle, collage and play with art. Anyone can do this. Experiment, enjoy, have fun, be okay with making a mess and then finding a way to clean it up by pasting a beautiful image over it or painting over it. Transforming one image into another is part of the creative process. It is a process. Our sacred circles are safe places to play, to go within, to discover the awesomeness hidden beneath the thoughts that the left logical side of the brain would have you believe about yourself. Your journal becomes a trusted friend. No two journals look alike just like fingerprints. Join me in Sarasota (look under Workshops) and come paint with us. 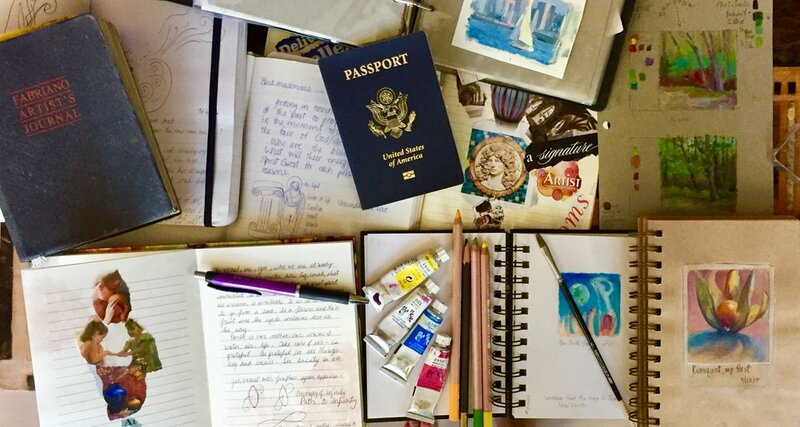 Whether you are a novice at making art, a beginner, intermediate or even advanced, in the 3 or 5 day workshops in Sarasota, FL or overseas you will really understand the value of keeping a journal. Getting away for a day or better yet, several days is a wonderful way to see from a new perspective. An art journal is like a personal diary yet it is so much more. As an artist, finding a theme is sometimes a challenge. I love helping you discover what turns you on and is worth developing. Artists...In the Color & Energy series of workshops, you will learn how to do small sketches first (& how to do them quicker), 6 Steps before you SSStart. Perfect for beginner to intermediate painters yet advanced painters will benefit as well.